Ever since the early days of my pregnancy, I have been excited to bring my love of healthy cooking to my new role as a parent. 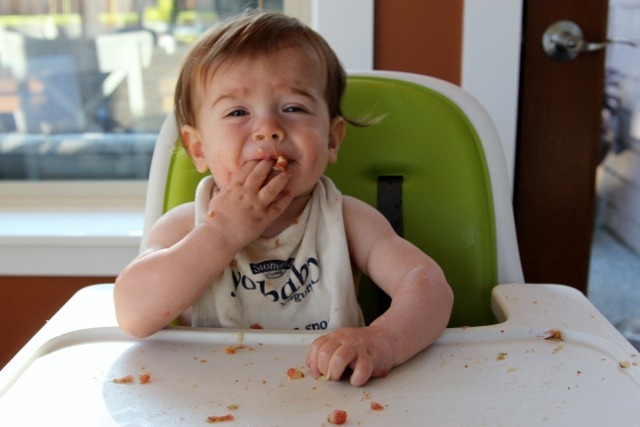 But before you click away – my plan is to introduce a series on foods that are great first foods for babies and kids. But that doesn’t mean that they aren’t also great foods for YOU! My hope is to spotlight some things you might not be as familiar with, as well as offer new ideas and preparations for foods that you already love. 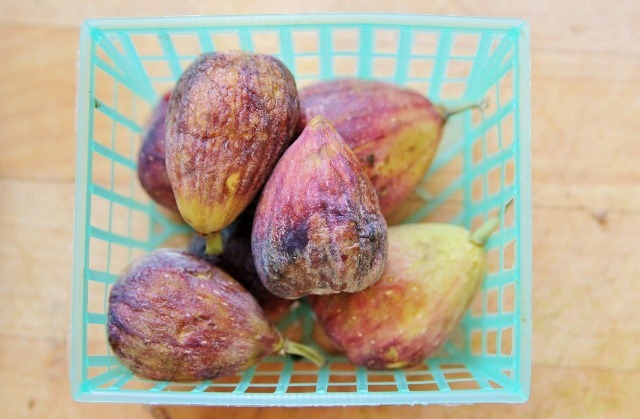 With all the summer hype about berries, melons, peaches, and plums – it’s easy to overlook one of summer’s best fruits: fresh figs! Typically in season from June to September, figs are soft and sweet and highly nutritious. When I spent the summer working on the farm, the farmers use to bring huge boxes of fresh figs in the kitchen each week. We couldn’t cook or eat them fast enough! Roasting figs for dessert was my favorite way to prepare them, but really, they are tasty just about any way you slice them. For babies, it couldn’t be more simple. 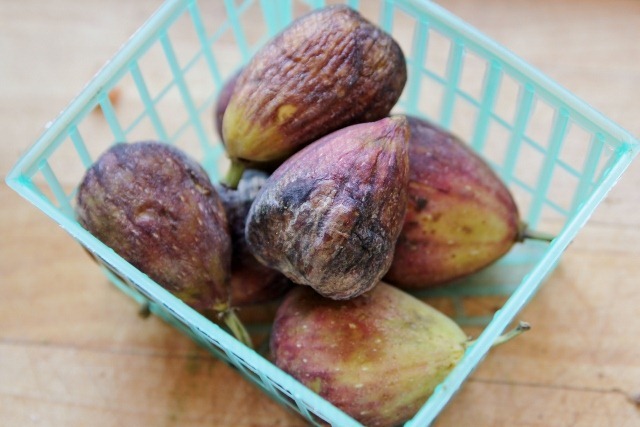 Figs are the perfect soft consistency that, when ripe, they need almost zero prep before hitting the high chair. I just trim off the ends and peel the outer skin off, before roughly dicing up the soft flesh inside. It’s not totally necessary to remove the outer skin – it’s definitely edible – but the skin may be a little rough on those tiny digestive systems. 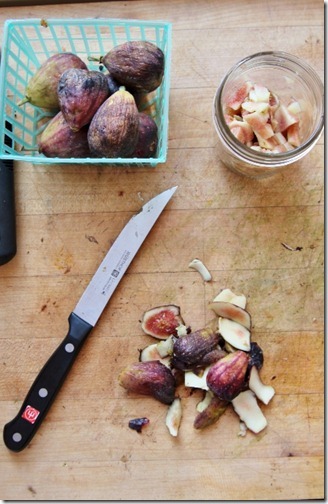 Figs tend to ripen and be ready almost immediately, and once they are ripe the window for eating them is very short. In order to minimize the prep, I go ahead and peel and dice all of them at once – saves me time on subsequent mornings. I add all the diced figs to a jar and store in the fridge – usually lasts for a few breakfasts. When perfectly ripe, the fruit is almost goopy it’s so soft. If your little one isn’t into finger foods just yet, another option is to puree the figs and add to cereals or combine with other fruits. The natural sweetness is a hit for those developing palates, and is easy to prepare with no need for cooking or steaming. As parents, I think we tend to err on the safe (and boring) side of what to offer our kids. My hope is to offer Cullen a good variety now, and hope that he grows up appreciating diversity in his diet. 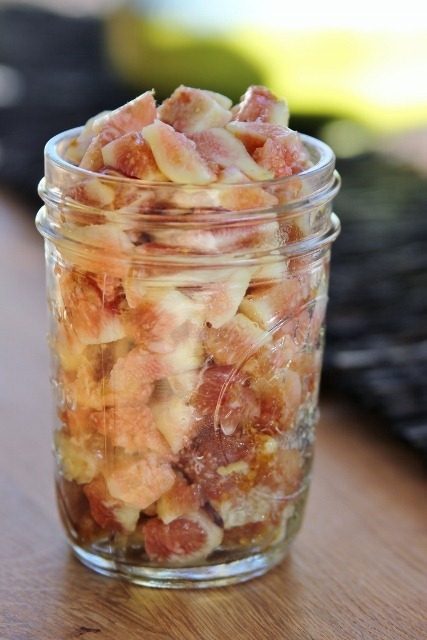 If you’re looking to break out of the rut of apples and bananas, I definitely suggest you give figs a try. They only negative? 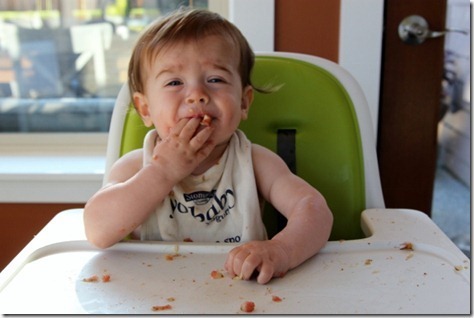 When eaten with slobbery fingers, they tend to be a bit of a MESS. But for being so nutritionally rich and easy to prepare, I’d say the extra cleanup is well worth it. « Previous PostQuinoa Stuffed Squash Boats. Next Post » Strawberry Banana Bread. Hi, Emily … I’ve been following your blog for quite a while now and i just wanted you to know that i love hearing all about all the new things you have to discuss now that little Culen is in the picture! I dont have kids or anything but i still enjoy these posts. I try and eat a variety of fruits and veggies, and I’m always trying new things…sometimes for the better (yay chestnuts!) sometimes for the bad (boo guava! ), but I don’t think I’ve ever had a fig, besides a Fig Newton. I’m going to have to be on the look out for some fresh figs! 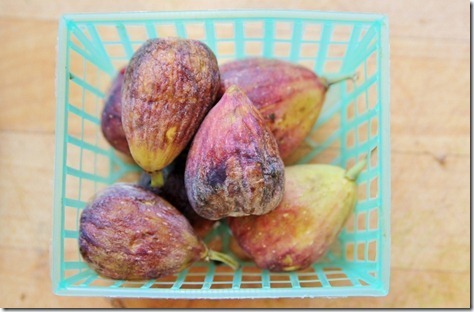 I tried figs for the first time with my kids when they were around 9 months. We ALL loved ’em and they have become a staple during their short season. I also buy unsweetened dried figs from my health food store during the off season to tide us over. So good! OMG I have recently discovered my obsession for dried figs! I have yet to try fresh ones but some day I will! I’ve loved figs ever since I was little like Cullen. My great grandparents had a fig tree and we’d pick them off fresh and eat them! So good! Figs have never ever in all my life crossed my mind! Thanks for waking me up to a new adventure. I’ve actually never had a fig! Where exactly can I find them? (I live in MN)…love this new series! I tried figs for the very first time last year! I love them, they’re so tasty. This series is great, I think you’re right, it’s easy to err on the safe side when trying to figure out what to feed your little ones. That last pictures is priceless! 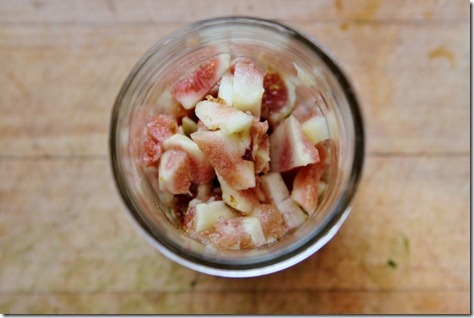 I had no idea that figs were such a good source of calcium. I discovered them last summer, and they really are awesome! On the dried front, I’m slightly obsessed with these date fig bars! Figs=my favorite fruit! 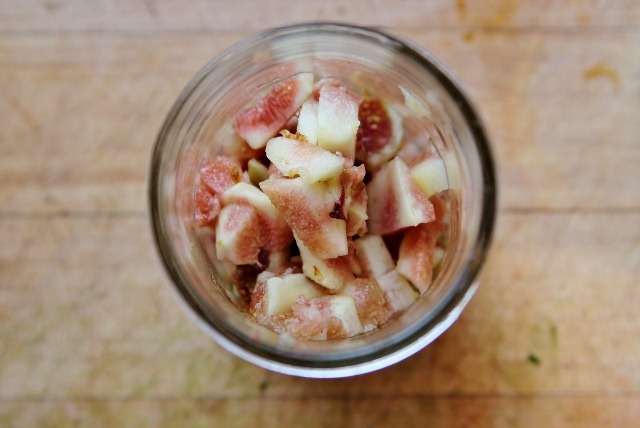 My grandmother used to have a white fig tree in her backyard that would produce figs the size of small pears. Heavenly. P.S. Skins contain cancer-fighting antioxidants, and figs are the perfect size and texture for baby hands, plus there’s no pit to worry about… I really suggest you try letting your little guy eat one whole! I think eating foods in different ways is also a great way for kids to explore the world. I haven’t quite recovered from fig overload when I was in Ecuador.. but.. maybe one day I will give them another try. this is pretty interesting info as i’m trying to learn all i can before i have a little one! 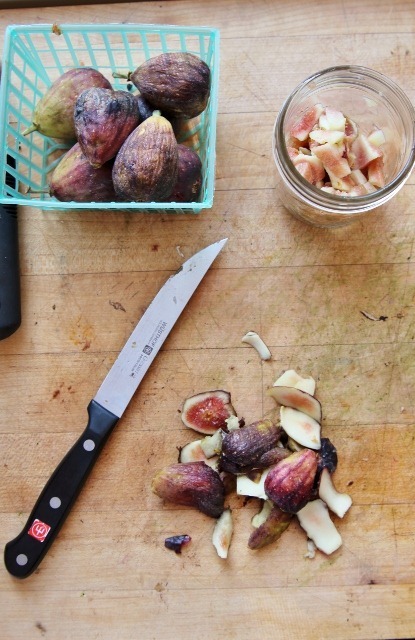 we love, love, love fresh figs & have several friends/relatives with trees. 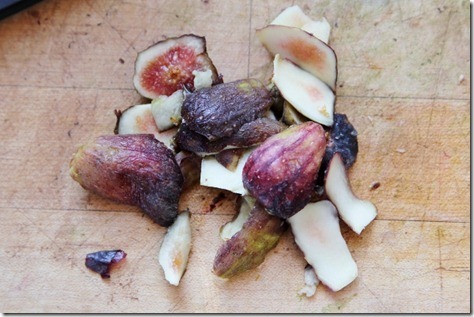 we’ve been eating them like crazy this summer & i think we’re planting our own fig tree very soon! If possible, I never peel them, the skin adds a terrific and stronger taste to the fruit, dont’t you think ? Figs are by far my favorite fruit! I wish they were always in season! Check out boogie wipes to help with the anti nose wiping phase. They are basically like wipes for diapers only with saline. One swipe pretty much takes care of it! Those look amazing. It’s rare to see figs at the grocery store but I see them at the farmer’s market. I love trying it!